The idea isn‘t new. The Easy Star All-Stars collective did it with albums by Pink Floyd, Radiohead, The Beatles, and more recently with Michael Jackson‘s Thriller. Little Roy did it with Nirvana classics on his tribute album Battle For Seattle. Translating classics of popular music into reggae is as old as the genre itself: just think of the endless number of soul hits reinterpreted by rocksteady and reggae foundation artists. Or tune in to Irie FM to discover the masses of recent US pop hits translated into reggae. The simple structures of reggae music facilitate adaptations from other genres. Still, Hemp! Tributo Reggae a The Beatles Vol. 2 stands out and doesn‘t lend itself to easy comparisons with the examples stated above. It is the sequel to El Album Verde that united South American reggae artists in 2005 to record their favorite Beatles track in their favorite genre. Vol. 2 takes the idea one step further: this three CD collection features contributions from a whopping 56 artists hailing from the Americas, Europe, Africa, and Oceania, with some pretty big names showing up on the track list. The tunes were recorded in 35 different studios. This major project was coordinated by Argentinian producer Hernan Sforzini. The slightly unusual naming of the selection, Hemp!, isn‘t a reference to The Beatles meeting Bob Dylan in a New York City hotel suite in August 1964, where Dylan introduced the Fab Four to ganja, as the legend goes. One could see it as a reference to Help!, The Beatles‘ second film, released in July 1965. The press release text states that the project wanted to spread “a message of ecological awareness” and provide “information on the use of industrial hemp.” This information might be in the booklet; since my digital review copy came without one, I cannot comment on that. The connection between hemp and musical tributes to The Beatles remains unclear to me. The Beatles started to use ganja on a regular basis after their meeting with Dylan, but then again, rather few are the reggae artists who don‘t... Maybe it‘s The Beatles‘ fuelling of the environmentalist movement in the 1960s counterculture that Jonathan Gould suggests in his 2007 monography Can‘t Buy Me Love: The Beatles, Britain and America. The Beatles are undisputedly the most influential band in the history of popular music. The Rolling Stone considers the best-selling band in history the all-time best artist and ranks four of their albums on top-ten positions of their “500 Greatest Albums of All Times” list - with Sgt. Pepper‘s Lonely Heart Club‘s Band on number one. And yet, I‘m still amazed by the long list of Beatles-loving reggae artists Sforzini could invite to hand in their versions. As with all translations, the result is never an exact copy of the original. The tribute versions of this collection are interpretations that don‘t try to conceal the entirely different backgrounds of the translators. Some contributors even modified the lyrics quite a bit to fit their needs. Three songs appear twice on this selection: The Fool on the Hill (Sig Ragga; Danakil), Love Me Do (Mellow Mood; Pato Banton & Mellow Mood), and And I Love Her (Desmond Foster; Congo). The originals to the songs stem from all chapters of The Beatles‘ history. Some are originally solo works of former members, like John Lennon‘s mandatory Imagine, sung by Big Mountain with an intro spoken by U-Roy. 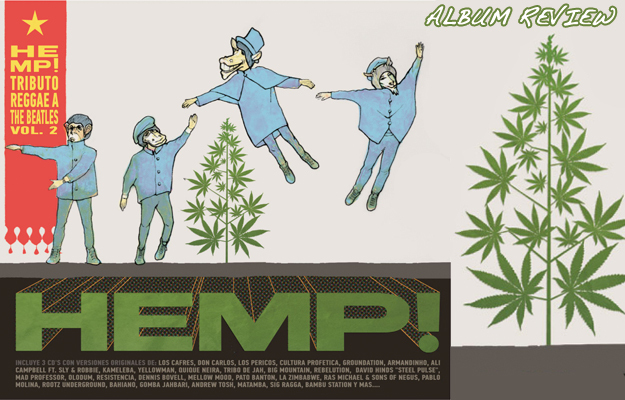 With 45 different songs, Hemp! Tributo Reggae a The Beatles Vol. 2 reinterprets roughly 20% of the Fab Four‘s opus. The selection focuses on the band‘s bigger hits. The quality of the individual productions is mostly more than adequate. The adaptations mostly sound carefully hand-crafted with attention to detail. Some tunes use musical instruments that were introduced to Western pop music by The Beatles, but still surprise today. I much enjoyed this selection by just pressing play once and lean back. The standouts include Ali Campbell‘s version of Hard Day‘s Night with its modern electronica touch that features Sly & Robbie on drums and bass, a moving version of Yesterday performed by St. Croix native Ras Attitude and the Oneness Band, and the intense interpretation of You Won‘t See Me by Raging Fyah. As well as Nkulee Dube‘s groovy Something, which she realized in collaboration with the UK‘s The Robotiks, and Prezident Brown‘s hip-hop-influenced From Me To You. Or the Nyabinghi version of Give Peace a Chance that Ras Michael & The Sons of Negus provided. Much less lion-hearted, Don Carlos and the Dub Vision Band chose Obladi Oblada and excel nevertheless. Rootz Underground are way on top with Across The Universe. Danakil convince with Fool On The Hill. Sebastian Sturm and his new band Exile Airline reject a Day Tripper (right around the release of their A Grand Day Out). Hemp! Tributo Reggae a The Beatles Vol. 2 offers a lot to discover on its three CDs. A great song is a great song, no matter in which style you play it. The real surprise is the versatility many of the contributors showcase here. If you are a Beatles-loving reggae addict, this one is a must. If you‘re not familiar with their works, however, I suggest you catch up before you check out this gem. Nothing beats the original. 10. Gomba Jahbari - Help!